Radioligand [11C]TMSX (see MICAD), previously known as [11C]KF18446, has been demonstrated to bind selectively to adenosine receptor subtype A2AR at least in myocardium, kidneys, skeletal muscle and in caudate nucleus and putamen areas of the brain (Ishiwata et al., 2003b; Ishiwata et al., 2004; Ishiwata et al., 2005; Mishina et al., 2007; Naganawa et al., 2007). For heart studies the radioligand is a potential new tool for diagnosis of ischemia and other myocardial diseases. A study detecting physiological changes in adenosine A2A receptors in cardiac and skeletal muscle during physical training has been performed (Mizuno et al., 2005). Results state that adenosine A2A receptor densities in myocardium are significantly greater than in skeletal muscle. A2AR densities in both regions of interest were also found to be greater in endurance-trained subjects compared to normal subjects; however in myocardium this effect was not seen in another study (Heinonen et al., 2008). [11C]TMSX did not show any difference in striatum of young and elderly subjects (Mishina et al., 2012). In heart, muscle, kidney and lung, radioactivity levels of [11C]TMSX were found to decrease gradually after the fast uptake period (Ishiwata et al., 2003a, 2003b, 2004). Radioactive metabolites are found at least in the mice heart muscle (Ishiwata et al, 2003b), and probably in other tissues as well. 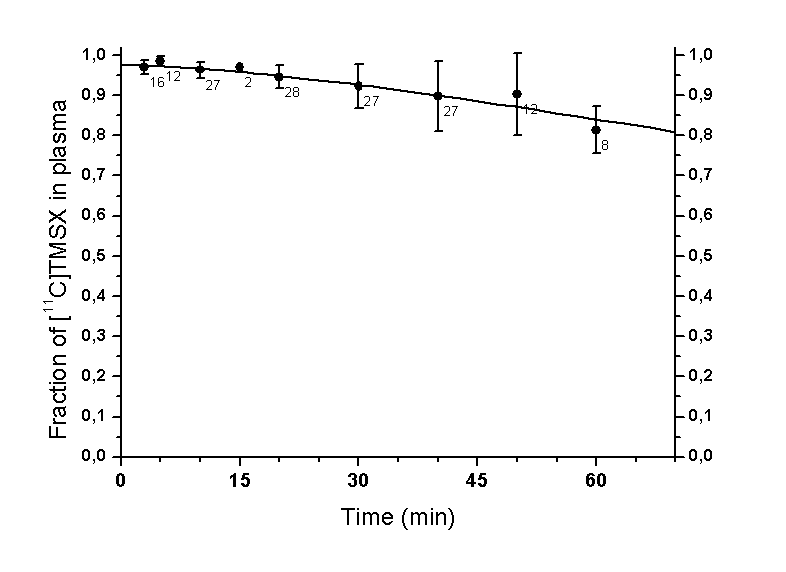 In the liver though, the radioactivity remained constant for 15 minutes before starting to decrease (Ishiwata et al., 2003a; Ishiwata et al., 2004). It can be assumed that a reversible model should be used in analysis of the data. Graphical analysis (Logan plot) has been used to estimate the distribution volume (VT) values for the brain (Rissanen et al., 2013), brown adipose tissue, and other tissues (Ishiwata et al., 2003b; Ishiwata et al., 2004). This requires averaged time activity curves (TACs) from the regions of interest and a metabolite corrected plasma curve as input function. Also theophylline blocking studies have been done with two human subjects. Theophylline is a non-selective adenosine A2A receptor antagonist used for treatment of asthma. Infusion of theophylline during scanning was discovered to reduce myocardial SUV of [11C]TMSX but not muscular SUV. The fraction of unchanged form of radioligand was larger during theophylline-infusion compared to the baseline, which is not accounted for in SUV calculation. Estimates for VT were reduced by around 20% in heart but only 10% in muscle. These facts should be considered when performing [11C]TMSX PET studies for patients receiving theophylline (Ishiwata et al., 2004). In mice and rats adenosine receptor antagonist reduced [11C]TMSX %i.d./g values strongly in muscle, heart and kidneys, but not in liver, and even increased uptake in lungs (Ishiwata et al., 2004). The free fraction of [11C]TMSX in plasma (fp) is 2.40% (Naganawa et al, 2014), or 9.1% (Rissanen et al, 2013); sticking to tubes may explain the different fp results. Normalization of VT by fp increased the variability (Naganawa et al, 2014). Blood-to-plasma ratio seems to be relatively stable after the initial phase of the PET scanning (Naganawa et al., 2007), and variation between measurements is high as compared to variation between subjects (Figure 1). First sample for blood-to-plasma calculation was taken at about 2.5 min after tracer administration, and in those samples blood-to-plasma ratio was in average 0.67 ± 0.03 (n=14, range 0.64-0.71). Naganawa et al (2007) calculated that blood-to-plasma ratio is 0.76 ± 0.012 after the peak. Initially, the level of the ratio suggests that [11C]TMSX either cannot penetrate the red blood cell membrane or stays in plasma because of plasma protein binding; but slightly higher later ratio suggests that labelled metabolites can be found in RBC. The average average initial ratio can be used to convert ABSS blood curve to plasma curve, or, if individual hematocrit is measured, conversions can be done using programs b2plasma and p2blood with setting norbc. Figure 1. Blood-to-plasma ratio from four PET studies. Although metabolism of [11C]TMSX is slow in mice (Ishiwata et al, 2000 and 2003b) and humans (Figure 2), plasma concentrations need to be corrected for recirculating metabolites. Rate of metabolism seems to be somewhat different in different subjects, and it may be affected by medication (Ishiwata et al., 2004). Hill-type and power functions fit the fraction curve equally well. Naganawa et al (2014) fitted a sum of exponentials to the measured parent fractions. Figure 2. Average fraction (with s.d.) of parent tracer [11C]TMSX in plasma, fitted with Hill-type function. Number of subjects available for each time point is specified in the graph. [11C]TMSX contains [11C]methyl group, attached to nitrogen, suggesting that [11C]CO2 and its products, [11C]urea, [11C]glucose, and [11C]lactate would be the main radioactive metabolites. [11C]TMSX and some other xanthine-type A2AR tracers undergo photoisomerization; to prevent that the preparations for tracer injection preparation and plasma metabolite analysis have to done under dim light. As an alternative to invasive arterial sampling, a model-based method for deriving plasma input TAC from clustered regional brain data has been developed (Naganawa et al., 2007 and 2008). Image-derived input function from a large arterial pool (such as LV cavity of the heart or aorta) can be used if available, and after conversion to plasma TAC, combined with TAC from manual plasma samples. Population-based input function is also feasible, even when only dose and BSA were used for scaling (Rissanen et al., 2015). In a human brain study the cerebellum was at first suggested to be non-suitable as reference region because of specific binding. However the level of specific binding in cerebellum (and cerebral cortex) is so low compared to nonspecific binding that quantification of A2AR binding there is difficult (Ishiwata et al., 2005). Instead of the cerebellum, use of centrum semiovale as reference region was proposed by Naganawa et al., 2007, if VT in that region is not affected by the studied disease. In compartmental model fitting with arterial input K1/k2 could be first estimated in centrum semiovale (using one-tissue compartment model), and then constrained when fitting two-tissue compartmental model to the other regions (Naganawa et al., 2007). Binding potential BPND can be calculated as VTROI/VTRef-1 from VTs estimated using compartmental model or Logan plot with arterial plasma input function (Naganawa et al., 2007, Mishina et al., 2007). Naganawa et al. (2007) suggest using time range 10-40 min for linear fitting in the Logan plot in the brain. Later, the same group has used cerebral cortex as reference region to estimate the distribution volume ratio (DVR) and BPND in human striata (Mishina et al., 2011 and 2012; Naganawa et al., 2014). Test-retest reproducibility was better with reference region input methods than with plasma input, especially when centrum semiovale was used instead of cerebellum (Naganawa et al., 2014). Cerebral cortex curve can be extracted from dynamic PET images using supervised clustering technique (Rissanen et al., 2015). P-glycoprotein at the blood-brain barrier (BBB) limits the uptake of [11C]TMSX. The effect is usually the same in the region of interest and in the reference region, thus the BPND estimates are not affected (Ishiwata et al., 2007). However, some diseases may affect the integrity of BBB differently in different brain areas. Ishiwata et al. (2003b and 2004) have validated the use of graphical analysis (Logan plot) with arterial plasma input function in estimating distribution volume (VT) for heart and skeletal muscle. When high-binding regions (striata) in the brain are studied, cerebral cortex or centrum semiovale could be used as input function to calculate DVR and BPND with Logan plot analysis (Mishina et al., 2011; Naganawa et al., 2014). Usage of supervised clustering technique for extracting the cerebral cortex TAC (Rissanen et al., 2015) is recommended. If the studied disease or treatment does not affect the plasma clearance of [11C]TMSX, then population-based input function could be used instead of individual blood sampling (Rissanen et al., 2015). Otherwise the normal blood sampling and metabolite analysis procedures must be followed, remembering to protect the samples from light. Dispersion correction is not applied because the effect of dispersion is minimal in case of an 11C labeled tracer and Logan plot. Output TACs are calibrated and corrected (for physical decay, and delay-time). 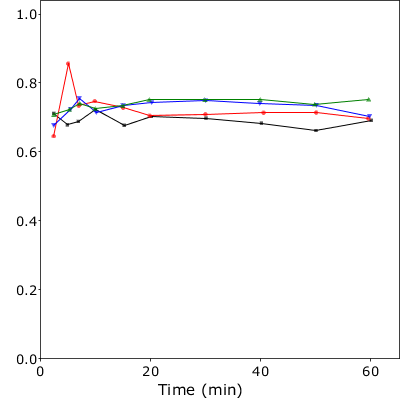 In addition, the script will create SVG and/or PNG images where the user can verify how fit of the function into the fraction data succeeded, how delay correction succeeded and how the result curves look like. Output TACs are calibrated and corrected for physical decay. In addition, the script will create SVG and/or PNG images where the user can verify how fit of an exponential function into the fraction data succeeded, and how the result curves look like. Heinonen I, Nesterov SV, Liukko K, Kemppainen J, Någren K, Luotolahti M, Virsu P, Oikonen V, Nuutila P, Kujala UM, Kainulainen H, Boushel R, Knuuti J, Kalliokoski KK. Myocardial blood flow and adenosine A2A receptor density in endurance athletes and untrained men. J Physiol. 2008; 586(Pt 21): 5193-5202. doi: 10.1113/jphysiol.2008.158113. Ishiwata K, Noguchi J, Wakabayashi S, Shimada J, Ogi N, Nariai T, Tanaka A, Endo K, Suzuki F, Senda M. 11C-Labeled KF18446: a potential central nervous system adenosine A2a receptor ligand. J Nucl Med. 2000; 41: 345-354. Ishiwata K, Wang WF, Kimura Y, Kawamura K, Ishii K. Preclinical studies on [11C]TMSX for mapping adenosine A2A receptors by positron emission tomography. Ann Nucl Med. 2003a; 17(3): 205-211. Ishiwata K, Kawamura K, Kimura Y, Oda K, Ishii K. Potential of adenosine A2A receptor antagonist [11C]TMSX for myocardial imaging by positron emission tomography: a first human study. Ann Nucl Med. 2003b; 17(6): 457-462. Ishiwata K, Mizuno M, Kimura Y, Kawamura K, Oda K, Sasaki T, Nakamura Y, Muraoka I, Ishii K. Potential of [11C]TMSX for the evaluation of adenosine A2A receptors on the skeletal muscle by positron emission tomography. Nucl Med Biol. 2004; 31(7): 949-956. Ishiwata K, Mishina M, Kimura Y, Oda K, Sasaki T, Ishii K. First visualization of adenosine A2A receptors in the human brain by positron emission tomography with [11C]TMSX. Synapse 2005; 55(2): 133-136. Ishiwata K, Kawamura K, Yanai K, Hendrikse NH. In vivo evaluation of P-glycoprotein modulation of 8 PET radioligands used clinically. J Nucl Med. 2007; 48(1): 81-87. Khanapur S, van Waarde A, Ishiwata K, Leenders KL, Dierckx RA, Elsinga PH. Adenosine A2A receptor antagonists as Positron Emission Tomography (PET) tracers. Curr Med Chem. 2013; 21(3): 312-328. Lahesmaa M, Oikonen V, Helin S, Luoto P, U Din M, Pfeifer A, Nuutila P, Virtanen KA. Regulation of human brown adipose tissue by adenosine and A2A receptors - studies with [15O]H2 and [11C]TMSX PET/CT. Eur J Nucl Med Mol Imaging 2018 (in press). doi: 10.1007/s00259-018-4120-2. Mishina M, Ishiwata K, Kimura Y, Naganawa M, Oda K, Kobayashi S, Katayama Y, Ishii K. Evaluation of distribution of adenosine A2A receptors in normal human brain measured with [11C]TMSX PET. Synapse 2007; 61(9): 778-784. Mishina M, Ishiwata K, Naganawa M, Kimura Y, Kitamura S, Suzuki M, Hashimoto M, Ishibashi K, Oda K, Sakata M, Hamamoto M, Kobayashi S, Katayama Y, Ishii K. Adenosine A2A receptors measured with [11C]TMSX PET in the striata of Parkinson’s disease patients. PLoS ONE 2011; 6(2): e17338. Mishina M, Ishiwata K. Adenosine receptor PET imaging in human brain. Int Rev Neurobiol. 2014; 119: 51-69. Mishina M, Kimura Y, Naganawa M, Ishii K, Oda K, Sakata M, Toyohara J, Kobayashi S, Katayama Y, Ishiwata K. Differential effects of age on human striatal adenosine A1 and A2A receptors. Synapse 2012; 66(9): 832-839. Mizuno M, Kimura Y, Tokizawa K, Ishii K, Oda K, Sasaki T, Nakamura Y, Muraoka I, Ishiwata K. Greater adenosine A2A receptor densities in cardiac and skeletal muscle in endurance-trained men: a [11C]TMSX PET study. Nucl Med Biol. 2005; 32(8): 831-836. Naganawa M, Kimura Y, Mishina M, Manabe Y, Chihara K, Oda K, Ishii K, Ishiwata K. Quantification of adenosine A2A receptors in the human brain using [11C]TMSX and positron emission tomography. Eur J Nucl Med Mol Imaging 2007; 34: 679-687. Naganawa M, Kimura Y, Yano J, Mishina M, Yanagisawa M, Ishii K, Oda K, Ishiwata K. Robust estimation of the arterial input function for Logan plots using an intersectional searching algorithm and clustering in positron emission tomography for neuroreceptor imaging. Neuroimage 2008; 40: 26-34. Naganawa M, Mishina M, Sakata M, Oda K, Hiura M, Ishii K, Ishiwata K. Test-retest variability of adenosine A2A binding in the human brain with 11C-TMSX and PET. EJNMMI Res. 2014; 4(1): 76. doi: 10.1186/s13550-014-0076-9. Rissanen E, Tuisku J, Luoto P, Arponen E, Johansson J, Oikonen V, Parkkola R, Airas L, Rinne JO. Automated reference region extraction and population-based input function for brain [11C]TMSX PET image analyses. J Cereb Blood Flow Metab. 2015; 35: 157-165. doi: 10.1038/jcbfm.2014.194. van Waarde A, Dierckx RAJO, Zhou X, Khanapur S, Tsukada H, Ishiwata K, Luurtsema G, de Vries EFJ, Elsinga PH. Potential therapeutic applications of adenosine A2A receptor ligands and opportunities for A2A receptor imaging. Med Res Rev. 2018; 38(1): 5-56. doi: 10.1002/med.21432. Vuorimaa A, Rissanen E, Airas L. In vivo PET imaging of adenosine 2A receptors in neuroinflammatory and neurodegenerative disease. Contrast Media Mol Imaging 2017: 6975841. doi: 10.1155/2017/6975841.